Last week we shared our first FMYI User Survey insight — What Does FMYI Help You Do? In this post, learn more about usage frequency and, in our users’ own words, how they describe the FMYI platform. We asked our users, “How often do you use FMYI?" While more than half of FMYI users sign in every day, and since our platform supports custom roles and functions, we’re not surprised by the variance in access frequency. Executive roles may sign in a few times a month to run reports where as a project manager may utilize FMYI everyday to organize and track their tasks. In the chart above, 35% of users ‘only use FMYI.' 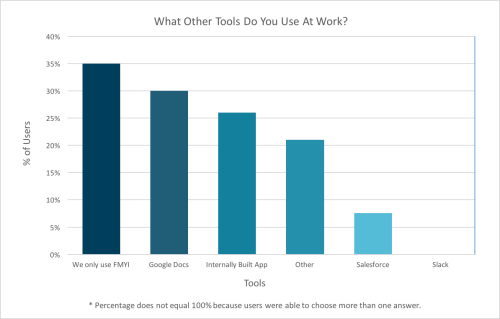 Based on word-of-mouth feedback, we expected to see that FMYI was one of a suite of tools used in our users’ day-to-day workflow. We were pleased to learn that FMYI alone is sufficient for more than a third of our users. A great tool for sharing ideas and working collaboratively without the tangle of email string. [FMYI] Can be used as evidence of a group decision-making process and is extremely useful as virtual minutes to decisions. A message board and a simple collaboration tool for the office. It’s helpful for us to hear that FMYI can be used in a simple way while having robust data tracking features. We have a people-focused and friendly interface like Facebook, but with the visual data tracking features of a SaaS-based modern version of FilemakerPro. What a great combination! Developed with customers’ needs in mind, FMYI is intended to help businesses grow and be successful. Surveys help us get to know our users better, validate what features work well, and prioritize what we need to add for continuous improvement. Thanks again to all who participated! If you haven’t read our previous blog post, we’re getting ready to launch the next generation version of FMYI this in a few months. We’re excited to show you our redesigned dashboard, navigation, and features. Sign up to be a beta tester or get a 20-minute demo. Contact me, Lauren@fmyi.com, if you would like a sneak peek of our new and exciting redesign.